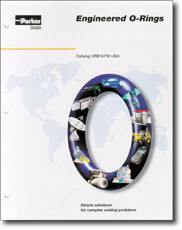 Irvine, Calif.-based Parker Hannifin Seal Group has released a new catalog, “Engineered O-Rings,?? which describes the many product forms and applications for its o-ring seals. The company engineers o-rings for automotive systems, chemical processing equipment, medical devices, aerospace vehicles and ultra high purity semiconductor processing. The catalog describes the in-house compound mixing and tooling operations the company uses in its o-ring engineering process.